As our campaign continues and the KCE II campus begins to take shape, we are excited to share this special summer update. KCE II construction is divided into different phases. 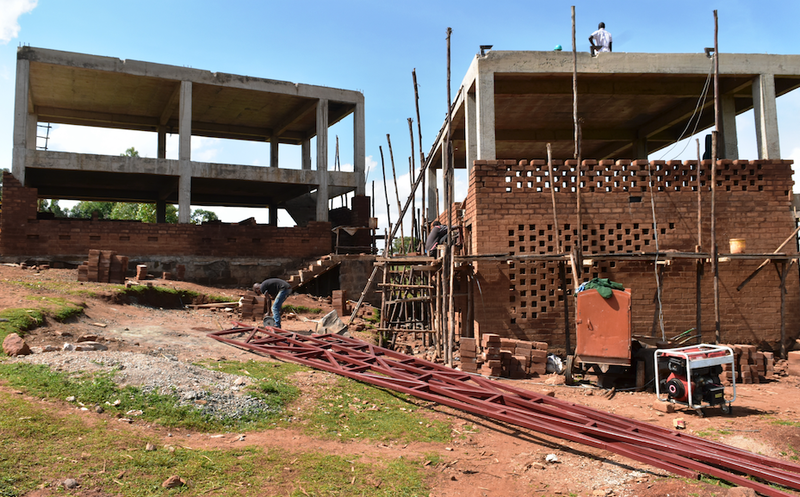 Eventually, it will have six classroom buildings (two classrooms each) for grades K-12, two laboratories, teacher housing, a multipurpose hall, and more than a dozen dormitory buildings for students ranging from 3-12 grade. Right now, the construction crew is hard at work on the first two classroom buildings (four rooms total) and two buildings for teacher housing. These will be completed by mid-August and construction will begin on another classroom building, two student dormitories, and a building for staff housing. Construction is underway on the classroom buildings. Learn more about the innovative and sustainable blocks used for construction here. The ongoing construction is not slowing down the teachers and students, however. 18 ninth grade girls are already attending KCE II. They are living and learning in high-quality temporary housing while the first phase of construction is completed. They are are already offered 11 different subjects as part of the KCE II high school curriculum: English, Math, Kiswahili, Biology, Chemistry, Physics, Religion, Agriculture, Geography, History, Business studies. It is so amazing to see this big dream come to life. Kakenya’s Dream is so grateful to each supporter for making this dream a reality!